I first read this poem in the 1970’s, when everyone seemed to be reading passages from The Prophet at weddings. I know I have shared parts of it with my children over the years. It certainly helped Bob and I weather both stormy toddler and teen moments. One more thing...she now officially hates being on her back. She will sleep so peacefully on us then the second we put her down she goes nuts. :) Oh the questions. That is just one of the text messages that I've received this week. Day or night, weekday or weekend (as my husband will attest!) the messages flow in from clients who are pregnant, newly birthed, or even facing their first nursing strike at 6 months! I was at a home birth many years ago. The new mother had nursed the baby, and was just drying off after showering, and chatting to her husband about what had just happened, while I was quietly tidying the bedroom. As the parents came out of the bathroom, shining and clean, the midwife approached the baby, who was lying in a moses basket. 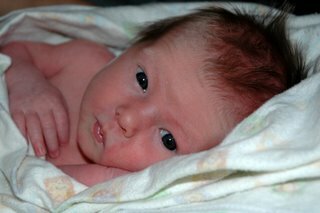 With the parents' permission, the midwife was going to do the newborn exam. She leaned close to the baby, and said something like..."Hello - I'm Patti. I'd like to pick you up and weigh you and measure you." I have a dilemma. After all my years as a doula, I'm still trying to discover the best way to help pregnant women have a successful start to breastfeeding. Breastfeeding classes are great, La Leche League meetings are supportive, our talks over months of pregnancy provide continuity, the breastfeeding books are inspiring, KellyMom and Dr. Jack Newman's videos are linked from my website, and I encourage all my clients to "like" his Facebook page. But one client just nailed the problem on the head in a phone call tonight: "It feels like I'm putting the cart before the horse if I try to think about breastfeeding now! I'm trying to finish up at work! I feel like I'm not prepared to have the baby yet! I have to get the baby born! I can't think about breastfeeding now!" Yes, I know, I'm paraphrasing, but the exclamation marks were certainly there. "It doesn't get easier, it just gets different"
As part of my doula service, I provide two prenatal visits, attend my clients' births, then make a postpartum visit to debrief and hug, but that's only the tip of the iceberg. I encourage my clients to call or email me frequently...for years (yes, I mean that). I'm often on the phone for a few hours each day, answering clients' questions, brainstorming, or providing support and encouragement. I encourage my clients to call me whenever a question arises during pregnancy or postpartum, which is SO much more helpful than asking them to store it up for visits. We're able to work through each concern in the moment. What have I been doing all this time? Well, it's been 8 months! I think I must have been rather busy, to have left my blog for this long! In addition to my doula work, "loving the grandsons" was added to my list of passions. With twins, there's a lot of room for family involvement, so we've all been chipping in daily to help our daughter and son-in-law and their brood. My memory of this past summer is long long walks by the seashore with my husband, carrying the boys in slings, allowing their parents a break at home...to sleep or eat, or just plain enjoy the peace and quiet. Man, I do love working with clients for a second (or third or fourth) time! I get to really connect with the mums, dig deeper into what makes them (and their labours) "tick", and watch the emergence and transformation of a mother. I love the postpartum visit, where I always manage to have a tea-party (or, in this case be presented with a wooden mixer and a plate of wooden toast, wooden egg, and a special spoon) laid on by a little sparkling one in a tutu, play a song or two, and hold a crying baby. I was driving home from visiting clients yesterday, and the CBC radio host was talking to a guest, asking if she lived in Van"cool"ver. It made me laugh, but it also made me think about one of my clients had been talking about her experiences at a Mum's Postpartum Drop-in. The women she had described sounded just a little bit to "cool" for a brand new mum to embrace. I mean...imagine you're a brand new mum...you've made the first trek out after being trapped in your house by the snow for WEEKS. You've been looking forward to this first drop-in mum's group - "Maybe I'll meet some new friends...and we can go out for coffee...our kids can have fun..." You get your baby tucked into her stroller. You dream about how great it could be as you sweat and grunt and push that stroller through the snow and ice. When a single friend calls to say that she’s had “quite the night!” it can mean many things. But, when a client calls me post-baby...well, it means something completely different. To all pregnant clients...here’s a “head’s up”. Some time after the baby’s born...you will make this phone call. The wording and timing may vary, but the questions will be essentially the same. We’ll probably spend up to an hour on this particular phone call. We’ll laugh together...we might cry together...then you’ll hang up the phone floating on air. Why? Because you will have been reminded of your infinite strength, your inner wisdom, and your ability to trust your body and your baby. If I had a newborn now, I would search for poetry to read aloud during each feeding, to calm us both and feed our souls. "In natural birth the woman is moving around in upright positions trying to find the most comfortable position and turning to herself to find her own inner strength. Such a woman is not so easy to control! She follows her own impulses and intuitions and her own body’s signals. She relies on nature. The same is valid for breastfeeding. The mother does not know how much her baby is eating, she has to rely on nature. This is the secret of success in the triad of reproduction (coitus, giving birth, and feeding from the breast): rely on nature, relax and let go, and you will be amply rewarded." Then, take some time to view the WHO/UNICEF Breast Crawl video. Perhaps we all need reminding that instincts work! I just melted when I saw this photo of a client with her two sons. It brings back memories of her youngest son's birth, at home, in the heat of a summer night, the fan blowing hot air around the room, the cool sound of the water in the tub, the midwife fanning herself, the speed with which this little one came... I believe the birth was everything that they could have hoped for. Complete joy. But, what this photo also brings to mind are the many phone calls and emails I receive from clients who have just had their second baby...whose births were so beautiful, but are now reeling from how busy life has become, how challenging it is to manage two children, how guilty they feel at giving less than 100% to their firstborn child, how it tears at their hearts when their firstborn just wants grandma or daddy, "NOT mummy!" "I loved reading your most recent blog entry. I haven't used a stroller in months (actually a couple of times, but just to carry the shopping bags, so that doesn't count) and use slings instead. Hannah even naps in it when we are out. Happier baby, happier mummy. I think every new mother should be given a sling (or some other carrier) when she gives birth!" Most clients know that I like to do without too much “stuff”...evidenced by our gradual downsizing, leading to our ultimate purchase of a small loft in Vancouver. Our internal and external spaces are now filled with what we do, not what we have. This shift wasn’t just driven by our need to find a personal solution to the environmental challenge on our planet. It is the continuation of a parenting plan that was born on the tidal flats of Point Roberts in 1982 - before our first was born, and long before the words “environmental footprint” or “sustainability” were commonplace.